The Red Velvetines – And A Giveaway!! You have probably noticed from my last couple of What I’m Listening To posts that I find amazing music all over the place. One of my favorite things about the music industry is how it is continuously evolving and changing. Today you hear music on commercials, online, in a restaurant, on a playlist – or anywhere else you can dream up – and there are a million different ways to connect with that music. There is Pandora, Spotify, iTunes, and Shazam. Then there is Facebook, Twitter, Tumblr, and all the other ways to get more personal with the artist. Really, there are about a million new ways to get to your next favorite band. So when I was asked to participate in a very cool online EP release party, I didn’t hesitate. Of course I would be involved! It works like this. Three other bloggers and myself would work with the band to come up with four different posts and spread the EP love to our readers on the release date, which just happens to be today. So many thanks to Christianna of The Girl With the Blue Bow, who is the party coordinator and asked me to participate. She has introduced me to a lot of great new music through her blog, and today she is reviewing The Red Velvetines new EP – The Black – which is available today on iTunes and on the band’s Bandcamp. 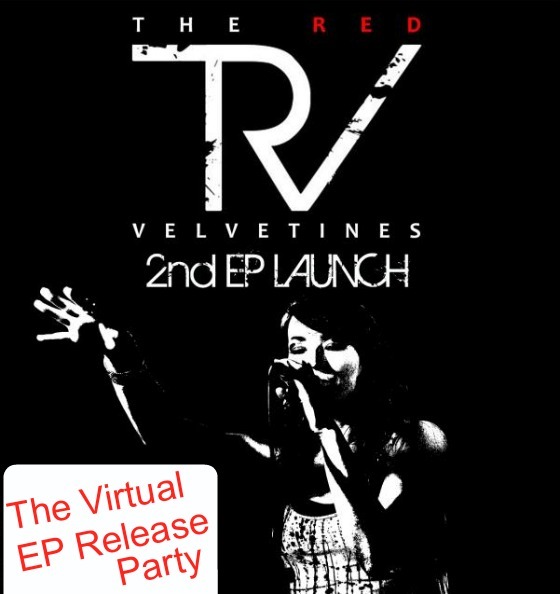 The Red Velvetines are an unsigned band with a very delicious name. With a female lead singer, a killer drummer, and a couple of bluesy guitarists, I’m an instant fan. And from Northern Ireland, they call their sound a mix of rock, roll and the “battered mars bar blues”. I have no idea what that means. Something to do with a candy bar, I hear. But I like it anyway. If I said I didn’t instantly think of how I could combine my love of food and music into this one post, I’d be lying. From what I gather, the band tries to eat relatively healthy. Although Corkie, the drummer, has one policy on food – If it doesn’t move, eat it – which I love. 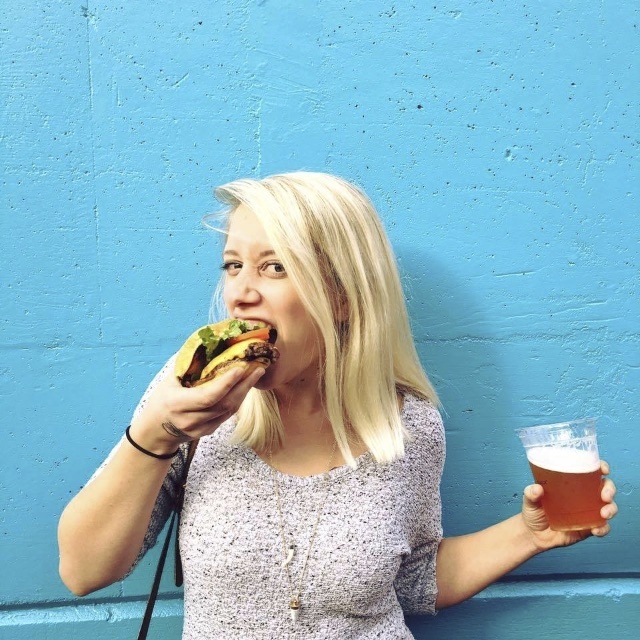 So I thought I’d help out and put together a list of some tips for eating healthy while on a rock and roll tour. Because I am an expert on this (well…) and I did not eat meatloaf at 1am last night (um, yes I did). Bring lots of snacks, but not the Doritos kind. Make your own trail mix with dried fruits and all kinds of different nuts. Nuts = protein which equals you not being hungry on the bus from Albequerque to Kalamazoo. And you know what? Throw some chocolate in there. Because there are antioxidants in chocolate… right?? When you need a meal and you’re going out to eat on the road, don’t always default to fast food. Too much Wendy’s will make your body hate you. Stop at a grocery store. Pick up real food. Get a sandwich at the deli or a box of cereal you can eat dry. Cereal is great for tour vans and buses. So is granola or almonds or even a bag of apples. Ok. Splurge every now and then. But only when you pass an In-N-Out. And order a Double Double. It is definitely worth it. Maybe order that Double Double without cheese. I hear Mick Jagger and Keith Richards don’t eat cheese. It kind of makes me wonder about their sanity, but also makes me understand a lot about how they’re still around. Maybe this is a rockstar thing to do? Oh, and drink plenty of bourbon or beer or red wine when you are not the driver. Because all good rockers do. So… maybe this isn’t the healthiest food advice for a rock band on tour, but I still wish the Red Velvetines the best luck in the world. Check them out on their Facebook, follow them on Twitter, listen to them on soundcloud and then go buy the EP here or here. 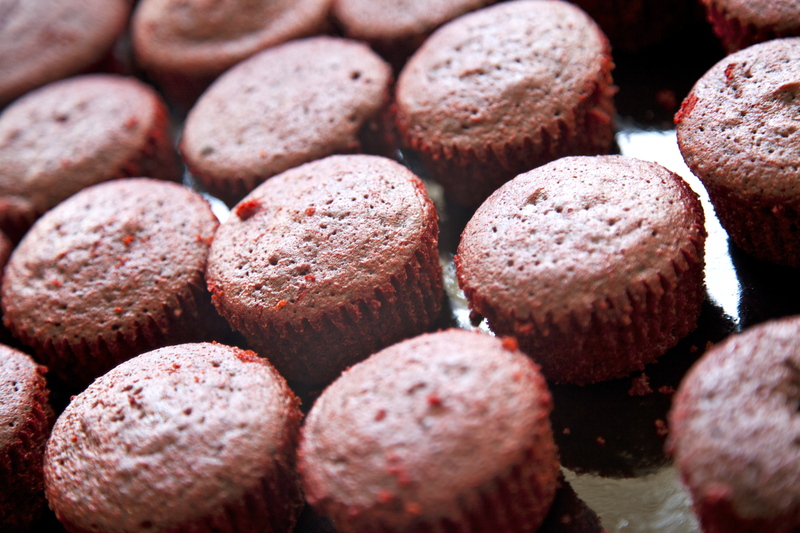 And think of them every time you come across a Red Velvet cupcake. And then check out the posts by the other ladies participating in this event. You’ll find an interview with the band by Stephanie at Heart Soul Inspiration and a Beauty Insider piece with Lead Singer Clair on Woke Up Pretty by Melissa as well as that EP Review by Christianne on The Girl with the Blue Bow. What is your favorite type of cupcake? Leave your answer in a comment below and I will randomly pick one person to win The Black EP on Monday, October 15 at 10AM PST! Good luck, and keep on rockin! I like all cupcakes from “Sprinkles! !” Maybe we need to make a trip tonight?? I’m a big fan of Pumpkin Cupcakes.. and THESE look DELISH. Any cupcake from Touche Touchet Bakery makes my day brighter. You have to come home to have one with me!